Happy and Lovely New Year with =LOVE ! After celebrating Christmas with =LOVE, we followed them to the Galaxy Theater for the first event of the year! Not less than 750 lucky fans had tickets for this first showcase of 2019! It was divided in two parts: a talk show with mini-games and many interactions with the audience, and a 30-minutes long mini-concert. The event started with a quick introduction of each member, telling the fans about their plans for New Year’s Eve. Fans learned that many of them had spent the day together! Saito Nagisa was in Karuizawa with her family, while Takiwaki Shoko went to Yamashita Park in Yokohama. Those kinds of moments are greatly appreciated by the fans because of the direct dialogue with their idols in a laid-back and friendly atmosphere. Oba Hana took the microphone to lauch the games! The girls were divided in two teams: Akagumi Team (Takamatsu Hitomi, Morohashi Sana, Takiwaki Shoko, Saito Nagisa, Otoshima Risa and Saito Kiara) and Shirogumi (Otani Emiri, Oba Hana, Sasaki Maika, Satake Nonno, Noguchi Iori and Yamamoto Anna). After that, each team from either side of the stage asked the fans located in front of them to light up their glowsticks, in red for Akagumi and white for Shirogumi. This was a clear reference to the legendary musical variety tv show Kouhaku Utagassen, held every year on December 31st and religiously watched by the entire country for decades. The first game started with charades! Each member had to mime words to their teams, and it was a tie up until the very last contestants. Neither Akagami nor Shirogumi could guess “helicopter” or “mushroom”. But all wasn’t lost: both fans and members had a really good laugh together! Oba Hana then announced the rules of the second game. The members of each team had to ask a question to the audience, who would answer with yes (raising their arms holding their glowstick up in the air) or no. The team getting the most glowsticks up would win the game! Despite a mistake from Hana announcing the victory of Akagumi, Shirogumi won this game. The penultimate game was the Japanese version of rock-paper-scissors. The winner has to hit the opponent’s head with a plastic hammer, while the looser has to put a helmet on her head quick enough in order to not get hit! The game was played in high spirits while the fans were dying of laughter. Akagami won this game hands down, bringing the score up to a perfect tie right before the final challenge. 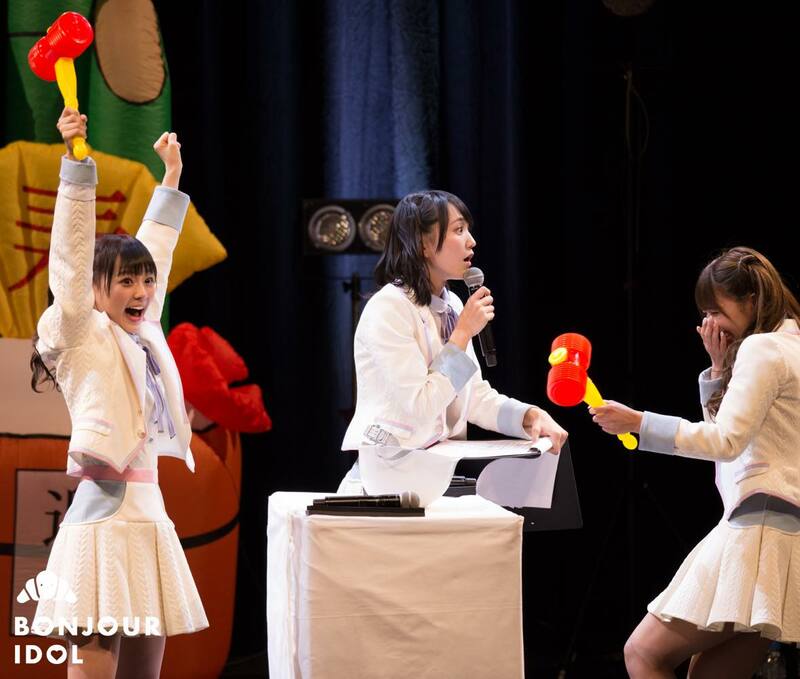 The last duel was our personal favorite here at Bonjour Idol, as it was an “English Only Quizz”: in other words, a quizz in which each member has to make her teammates guess a word, only by giving hints in English! 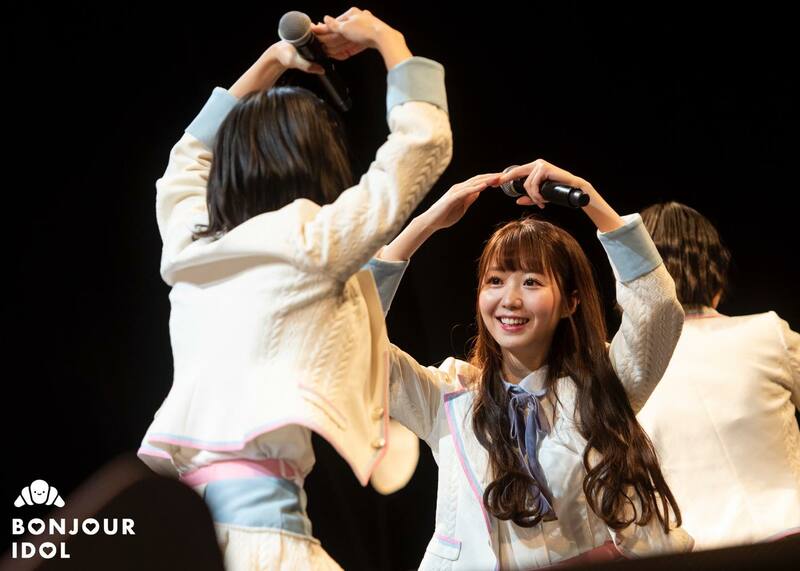 As the =LOVE members are not exactly well-known for being that comfortable with Shakespeare’s mother tongue, the result was hilarious both for the girls and the fans. We heard some surprising descriptions like “orange eat”, which got a “PIKOTARO !” as an answer. The best exchange turned out to be Saito Nagisa‘s, who managed to describe “snowman” by saying “snow balls”, then confirming it with an unsure “uuuh YES”. Akagumi won this last game and thus confirmed their victory of this very entertaining talk-show! Just like for the Christmas lives, the girls held a lottery raffle in which 12 lucky fans received exclusive signed goodies. After an hour and a half of talk-show, the long-awaited live started! This time, fans were allowed to take photos, so feel free to go check them out on Twitter with the hashtag #イコラブ ! Their latest single “Want you! Want you!” directly started after the group’s overture. After a brief talk, “Yokoso! Ikorabu Numa” welcomed the fans into this new year in an excited atmosphere! 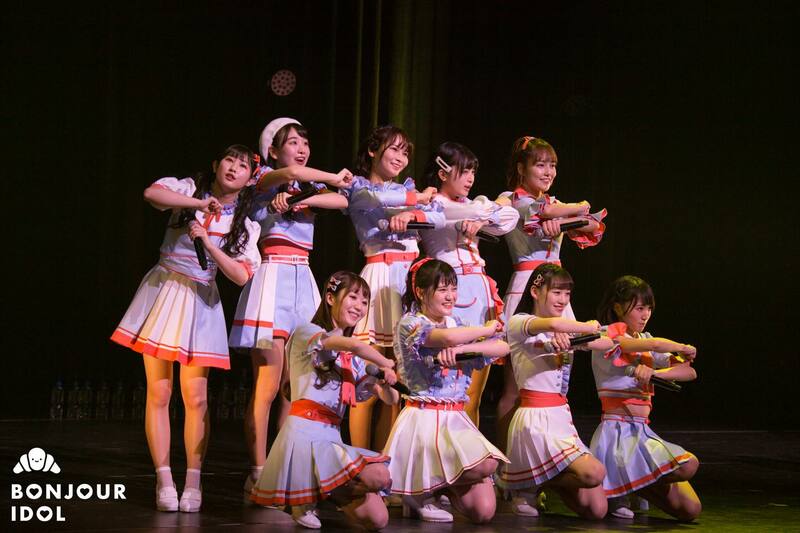 “Kiara, Tasuke ni Kita zo!”, “Bukatsu-chu ni Me ga Au Nante Omottetanda” followed and “Start!” definitely marked the beginning of 2019 for the group, which, let’s not forget, starts strongly with their first solo concert on February 16th! It was time for the last MC, in which members expressed their wishes for the new year. Sasaki Maika, who recently came back after a few months on a hiatus, had the privilege to express hers in a more solemn short speech. With this performance ended =LOVE‘s very first event of 2019! We can’t wait to see them on stage again and we wish them all the best for the new year. We would like to thank Jonathan Martin who kindly agreed to take pictures for us during his stay in Japan! Newer Post Bonne année 2019 avec les =LOVE ! Older Post Dernier concert de 2018 : Uchida Kotone fête son anniversaire !